Shortly after Barack Obama claimed victory in the fight for the Democratic nomination, I joined him aboard his chartered 757 campaign plane as a member of the press corps. He was flying from Chicago to Appleton, Wisconsin, for a town-hall meeting, one of a series he was doing in Midwestern and swing states to address constituencies he might have missed during the primaries — and, of course, to get some warm-up practice for any town-hall debates he has with John McCain. 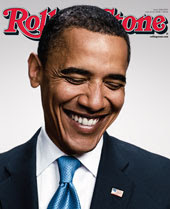 Barack Obama is on the cover of Rolling Stone Magazine, on stands now. Listen to him, browse his photos and enjoy.